This course is for people who have successfully completed the Working at Heights (CPO approved) training program. 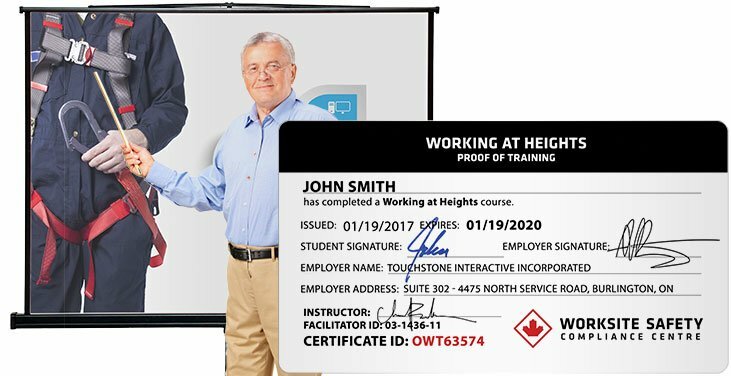 On the training day, you MUST provide your MOL distributed Working at Heights card or the Learner ID number on that card plus another proof of Working at Heights completion to take this course. If you are unable to locate this card or ID number call the Ministry of Labour (1-877-202-0008). You will be unable to complete the course without this information. Working at Heights – Fundamentals of Fall Prevention course approved by the CPO after April 1, 2015. It includes a hands-on demonstration of equipment and procedures to ensure learners can successfully inspect and use the required fall protection equipment. If you have not successfully completed an approved Working at Heights training program prior to enrolling in refresher training, the Ministry will not process the refresher training learner record. Certificate Issued	Upon completion of this 4 Hour training course, students will be issued a certificate showing proof of training, approved by the Ontario Ministry of Labour. Materials Provided	Course materials and a writing utensil will be provided.